We have introduced standard costs for wines in a particular Program. We use a list of Wine Stages against the Program to allow you to define a different standard cost rate for the wine in that Program based on the stage the wine is at. A Wine Stage may represent workflow states such as when wine is being produced, maturing, or ready for bottling/bulk sale. We allow you to define these Wine Stages per vintage and use a date range to determine which standard cost rate to use. Because these Wine Stages have settings specific to a Program you can edit them by going into Winery Setup > Workflow > Programs, and select the relevant Program. If you have the Standard Costs feature enabled you will be able to create a list of the Wine Stages for that Program. Here’s a summary of the fields and how they’re used in the system. Additionally, the “copy from” field will clear existing wine stages and copy the wine stages from the selected program. You can view the standard costs for the wines in your system by running our Standard Cost Activity Report from Reports > Management (Bulk wine) > Standard Cost Activity Report. This report allows you to view the effective costs of wine at different stages based on the filters provided, including filtering on one or more Programs. 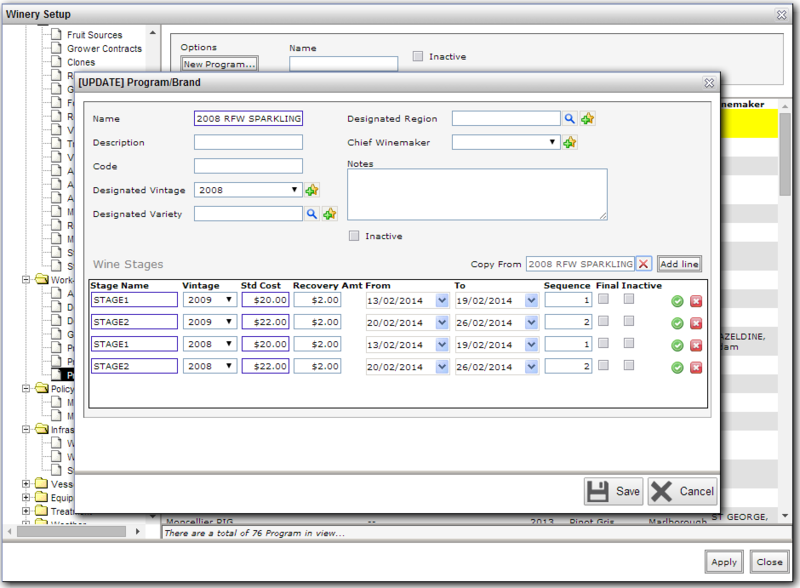 If you change the Trial/Final field to Final the system will take a snapshot of the volumes in each of the applicable Programs for that period. When you next run the report it will compare the opening balance to the last report’s closing balance and will detail and volume changes that may have occurred due to back-dated work orders. This report is produced as a spreadsheet. One other area where you can use a Wine Stage is if you have the Advanced Bulk Wine Purchasing option enabled (contact support if you would like it enabled). This allows you to specify the Wine Stage of a bulk wine you are purchasing. If for some reason the bulk wine you are purchasing is recorded at a different Wine Stage to the one it should be based on the date of the purchase, the system will allow you to compare the standard cost based on the date the wine was received and the standard cost relating to the Wine Stage it was purchased at. We have a specific report to show this comparison under Reports > Inventory > Bulk Stock Fiscal Receipt Report.